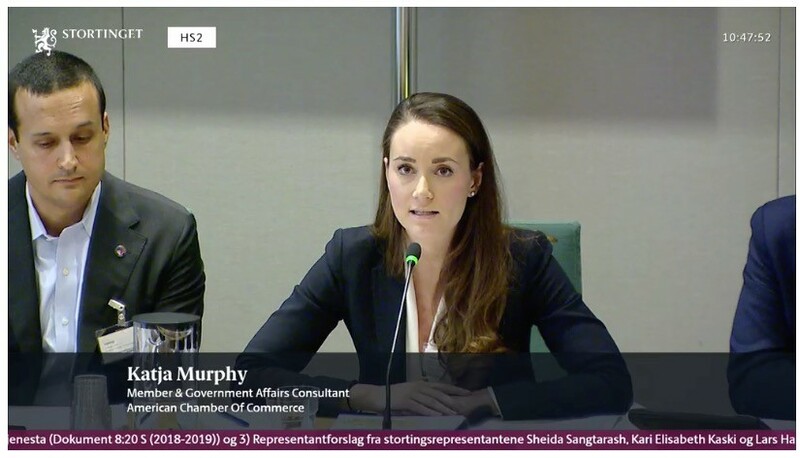 In June 2015, AmCham participated on a hearing regarding trademark elimination via plain packaging measures, urging the Norwegian government to forego it. On November 30th 2016, AmCham participated in the hearing process for new routines connected to the treatment of unit prices on pharmaceuticals. On July 14th, 2017, AmCham participated in the hearing process in the above hearing. On December 4th, 2017, AmCham sent letters to the Minister of Finance, Siv Jensen; Minister of Trade and Industry, Monica Mæland; Minister of Health and Care Services, Bent Høie; and the standing committee on Business and Industry. AmCham expressed its concern about the dramatic tax increase proposed for non-alcoholic beverages, chocolates and some confectionery products and appealing for them to halt the imbalanced Product Tax implementation. On June 21st, 2016, Managing Director Jason Turflinger wrote to Minister of Justice & Public Security Anders Anundsen on EU-US negotiations over Privacy Shield, encouraging him to support the rapid adoption of the Shield to promote business and protect consumers. On July 5th, 2017, Managing Director Jason Turflinger wrote to Senator Bernie Sanders, the ranking member on the U.S. Senate Committee on The Budget, to express AmCham’s concerns about proposed budget cuts for the Department of Commerce and Department of State. In concert with AmCham EU and several other European AmCham’s, AmCham Norway wrote to the European Commission to express their concerns regarding the European intellectual property (IP) incentives review.